It was not that Adam ate the apple for the apple's sake, but because it was forbidden. It would have been better for us--oh infinitely better for us--if the serpent had been forbidden. Adam was but human--this explains it all. He did not want the apple for the apple's sake, he wanted it only because it was forbidden. The mistake was in not forbidding the serpent; then he would have eaten the serpent. Let us be thankful to Adam our benefactor. He cut us out of the "blessing" of idleness and won for us the "curse" of labor. Adam, man's benefactor--he gave him all he has ever received that was worth having--Death. 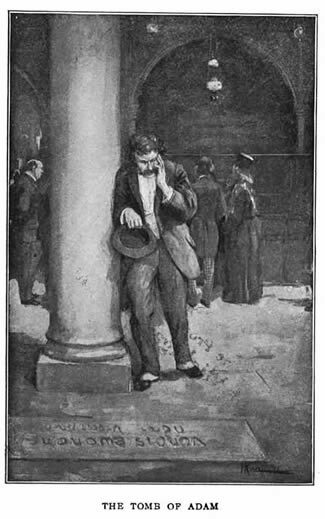 Illustration from HARPER'S MONTHLY, May 1875, p. 849. SAN FRANCISCO CALL, April 29, 1901, p. 3. Mark Twain Replies to Taunt That He Is Low Born. NEW YORK. April 28. - Mark Twain was a guest of the Brooklyn Clerical Union last night. It was "ladies' night," and President Rev. Dr. J. F. Carson welcomed the ladies with a eulogy of wives. "All our best and noblest impulses and inspirations come from them," said he. When Mark Twain's time came he said: "At just this time I am remarkably comforted by an invitation to meet a body of clergymen like this. Is it only in Brooklyn that I am appreciated. But what's the use of lugging that in about our wives? Don't you think that's extravagant? "Mrs. Clemens was too tired to come, and I'm glad she was. I don't want her to hear things like that. Why don't you people, so far as your calling will allow, try to tell the truth? To be sure, you sometimes get out of practice, but one saying one thing and one another you produce confusion in the minds of people about religious matters. "Rev. Dr. ___, oh, I won't mention his name, has just called me low born and ill bred. I don't mind that so much. Shakespeare was low born, too; and there was Adam -- I believe he was born out in the woods. But I'm glad the doctor didn't say it about Adam. When such a thing is said about the head of the family it hurts. Anyhow, I think I would prefer to be low born -- in a republic -- like the rest. If I had been born on the other side, why, then I would have liked to be born a Duke, as I suppose Rev. Dr. ___ I won't mention his name -- would have been, if he had been born there." It was Rev. Dr. Wayland Spauldine, president of the Congregational Clerical Union, who, on Monday last, called Mark Twain low born and ill bred. Adam was the original Bliss; if God had told him to help himself, the crop would have rotted on the trees; but as soon as He loaded the apples up with extra-territorial royalties and other wanton exactions and obstructions, Adam was bound to sample the orchard if it cost him his shirt-tail. "As far as I can see, he showed up best in naming animals. Considering that he hadn't ever seen any animals before, I am of the opinion that he did it very well indeed, as far as he got. He had a sure touch, on the common ones -- named them with insight and judacity, and the names stick, to this day, after all the wear and tear they've been through; it was when he struck the big ones and the long ones that he couldn't cash-in. Take, the ornithorhyncus, for instance. ... As we know, he skipped the ornithorhyncus. Left him out of the invoice. Why? ... In my judgment the alphabet was just beginning to accumulate, in that early day, and there wasn't much of it yet, and so it seems reasonable that he had to skip it because he couldn't spell it. ... Adam skipped a lot of the creatures. This has been the astonishment of the world for -- well, from away back. Ages, as you may say. But you can see, now how it was. He didn't want to skip, he wanted to do his honest duty, but there he was -- he hadn't the ammunition. He was equipped for short names, but not the others. If a bear came along -- all right, he was loaded for bear. There was no embarrassment. The same if a cow came along; or a cat, or a horse, or a lion, or a tiger, or a hog, or a frog, or a worm, or a bat, or a snipe, or an ant, or a bee, or a trout, or a shark, or a whale, or a tadpole -- anything that didn't strain his alphabet, you know: they would find him on post and tranquil; he would register them and they would pass on, discussing their names, most of them pleased -- such as leopards and scarlet tanagers and such, some of them pained -- such as buzzards, and alligators, and so on, the others ashamed -- such as squids, and polecats, and that kind; but all resigned, in a way, and reconciled, reconnizing that he was new to the business and doing the best he could. Plain sailing, and satisfactory, you see. But in the course of trade, along comes the pterodactyl -- ...Could he spell that? No, sir. Solomon couldn't. Nor no other early Christian -- not in that early time. ... in those old early geological times the alphabet hadn't even got up to the Old Red Sandstone period yet, and it was worse in Adam's time, of course; so, as he didn't want to let on that he couldn't spell it, he just said, 'Call again, office hours over for to-day,' and pulled down the shades and locked up and went home, the same as if nothing had happened. "It was natural, I think, and right enough, too. I would have done it; most people would. Well, he had a difficult time, limited the way he was, and it is only fair for us to take that into account. Every few days along would come an animal as big as a house -- grazing along, eating elephants and pulling down the synagogues and things: 'Dinosauriumiguanodon,' says Adam; 'tell him to come Sunday;' and would close up and take a walk. And the very next day, like enough, along comes a creation a mile long, chewing rocks and scraping the hills away with its tail, and lightening and thundering with its eyes and its lungs, and Eve scoops up her hair over her arm and takes to the woods, and Adam says 'Megatheriomylodonticoplesiosauriasticum -- give him his first syllable and get him to take the rest on the instalment plan,' which it seems to me was one of the best ideas Adam ever had, and in every way creditable to him. He had to save some of the alphabet, he couldn't let one animal have it all, it would not have been fair, anyway. "I will say it again, I think Adam was at his level best when he was naming the creatures, and most to be praised. If you look up your fossiliferous paleontology, I acknowledge you will have to admit that where he registered one creature he skipped three hundred and fifty, but that is not his fault, it was the fault of his alphabet-plant. You can't build a battleship out of a scrap-heap. Necessarily he couldn't take the whole of one of those thirteen-syllabers and pay spot cash; the most he could do was to put up a margin. Well, you know what happens to that kind of financing." Adam is fading out. It is on account of Darwin and that crowd. I can see that he is not going to last much longer. There's a plenty of signs. He is getting belittled to a germ -- a little bit of a speck that you can't see without a microscope powerful enough to raise a gnat to the size of a church. They take that speck and breed from it: first a flea; then a fly, then a bug, then cross these and get a fish, then a raft of fishes, all kinds, then cross the whole lot and get a reptile, then work up the reptiles till you've got a supply of lizards and spiders and toads and alligators and Congressmen and so on, then cross the entire lot again and get a plant of amphibiums, which are half-breeds and do business both wet and dry, such as turtles and frogs and ornithorhyncuses and so on, and cross-up again and get a mongrel bird, sired by a snake and dam'd by a bat, resulting in a pterodactyl, then they develop him, and water his stock till they've got the air filled with a million things that wear feathers, then they cross-up all the accumulated animal life to date and fetch out a mammal, and start-in diluting again till there's cows and tigers and rats and elephants and monkeys and everything you want down to the Missing Link, and out of him and a mermaid they propagate Man, and there you are! Everything ship-shape and finished-up, and nothing to do but lay low and wait and see if it was worth the time and expense. Well, then, was it? To my mind, it don't stand to reason. They say it took a hundred million years. Suppose you ordered a Man at the start, and had a chance to look over the plans and specifications -- which would you take, Adam or the germ? Naturally you would say Adam is business, the germ ain't; one is immediate and sure, the other is speculative and uncertain. Well, I have thought these things all over, and my sympathies are with Adam. Adam was like us, and so he seems near to us, and dear. He is kin, blood kin, and my heart goes out to him in affection. But I don't feel that way about that germ. The germ is too far away -- and not only that, but such a wilderness of reptiles between. You can't skip the reptiles and set your love on the germ; no, if they are ancestors, it is your duty to include them and love them. Well, you can't do that. You would come up against the dinosaur and your affections would cool off. You couldn't love a dinosaur the way you would another relative. There would always be a gap. Nothing could ever bridge it. Why, it gives a person the dry gripes just to look at him!